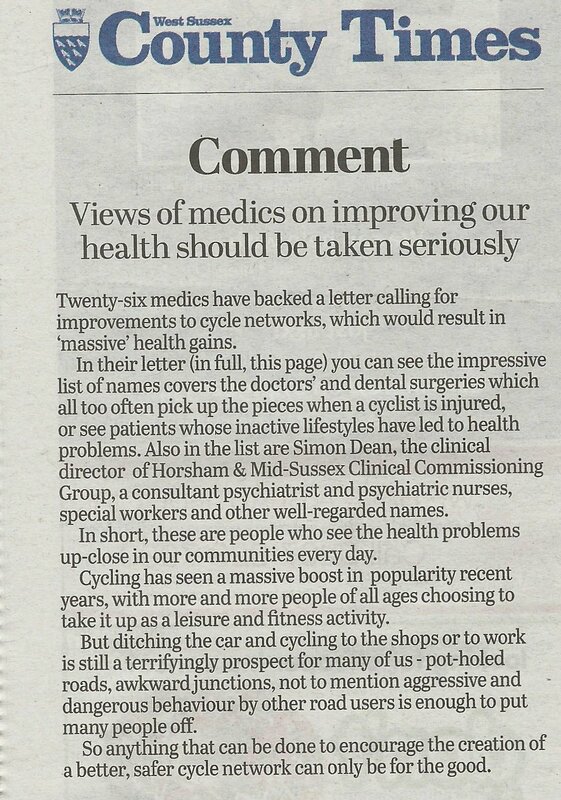 In an open letter to Horsham and West Sussex councils, 26 medical professionals have called for better road designs to get “massive” health benefits from more people being able to cycle. 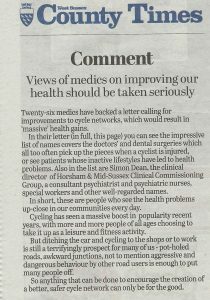 The letter was published in the West Sussex County Times alongside an Editorial calling on the views of the medics to be taken seriously in the creation of a “better, safer cycle network”. 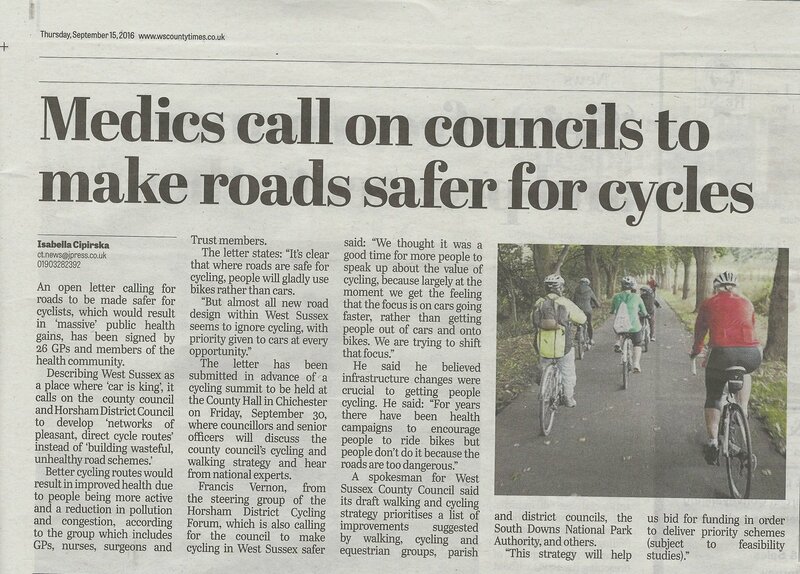 In the accompanying article, Horsham Cycle Forum member Francis Vernon called for better cycle infrastructure: “For years there have been health campaigns to encourage people to ride bikes but people don’t do it because the roads are too dangerous”. The open letter has been widely discussed on twitter and has also appeared on the Care Without Carbon website. As members of the local medical community we know there would be massive health benefits if large numbers of people chose to go by bike instead of taking the car for short journeys – people’s health would improve from being more active, whilst pollution and congestion would reduce. But this isn’t happening in West Sussex, where the number of people cycling to work has stayed at around 2% for the last ten years, with no sign of any change in sight, whilst numbers of people on bikes killed or seriously injured on the county’s roads has risen significantly over the past few years. It’s clear that where roads are safe for cycling people will gladly use bikes rather than cars. But almost all new road design within West Sussex seems to ignore cycling, with priority given to cars at every opportunity. Car is king in West Sussex – try riding across the new A264 west of Horsham junction, or taking a bike to the John Lewis/Waitrose stores in town to see what we mean. We challenge the assumption that designing roads to save extra seconds on motorists’ journeys should be prioritised over the public health gain of roads made safe for cycling. Local authorities are legally responsible for improving the health of their residents, so we support the local cycling forum in their calls on West Sussex and Horsham councils to stop building wasteful, unhealthy road schemes and to develop instead networks of pleasant, direct cycle routes in our towns and villages. We also ask West Sussex Public Health Dept to begin to discuss with the Highways Dept how best to develop such a network across the county.